One of the biggest attraction to cycling is the freedom it offers. You and your bike can go anywhere – but it’s likely that’ll you’ll come into some difficulty when trying to leave your front door if you don’t have a good hitch bike rack for cars. Having a good hitch bike rack will allow you to bring your bike with you on the road, without causing damage or chaos to your car. Hitching your bike to your car is a great way to make cycling in new and exciting locations easy. You and the whole family can go on an outdoor bike ride in a variety of different locations, without causing damage to your bikes or the car. The best hitch bike racks will be easy to use, durable and secure. See more bike accessories in our other review. This hitch bike rack can hold two bikes and makes traveling with cycling equipment stress-free. Each bike will be secured to your car through both their wheels and the frame, so there is no risk of them coming loose or getting lost. The cushioned hooks on this hitch bike rack are adjustable to suit a range of bikes, meaning all of the family can come along on the adventure. This bike rack features a built-in anti-wobble hitch device that keeps your bikes secure and safe on the road. The frame grip arms have been updated to be soft, preventing them from causing damage and protecting the paintwork. Why We Liked It – This hitch bike rack can hold two bikes and is incredibly secure, protective and adjustable. This hitch bike rack has a tool-free locking SpeedKnob system that makes it quick to install and easy to use. This installation is secure and safe, making it suitable for a range of vehicles. The bikes are secured to this rack through the ZipStrips which are removable and feature anti-sway cradles to keep your bikes secure on the road. The largely molded collars are gentle to your bikes paintwork and materials and they actively prevent damage. The rack arm mounts are solid and keep your bike tightly secured for a long period of time. The oversized diameter tubing and anti-rotation inserts offer great stability. Why We Liked It – This bike rack is incredibly secure and will keep your bikes in good condition when on the road. 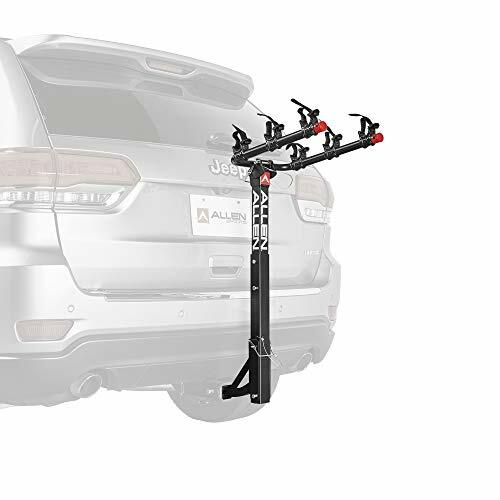 The Allen Sports Deluxe Hitch Mounted Bike Rack is a two-bike device that is ideal for camping trips or other family vacations. It features a no-wobble bolt that keeps it secure on your car and ensures that your bikes are safe when on the road. The tie-down cradle system individually secures your bikes to the rack and keeps them protected. This is easy to use and is adjustable to suit a range of bike frame sizes and models. The hitch bike rack tilts back which makes it easy to access the lift-gate access and to insert the bikes. This bike rack has a great capacity and is certain to make family cycling trips effortless. Why We Liked It – This two-bike hitch rack is secure and incredibly easy to use, making it suitable for family vacations. This bike rack has been specially made for families or large cycling excursions as it can handle four bikes at one time. It is easy to use, with the swing down feature that makes securing the bikes to the rack simple and quick. This is suitable for most family cars, although it cannot be used on RVs. This hitch bike rack is made from rigid steel that is durable and long-lasting. The bike cradle is adjustable with hook and loop straps which makes it suitable for bikes of all sizes. It is incredibly heavy-duty making it a great value bike rack. Why We Liked It – This bike rack is good for families as it has a great capacity and is durable. This hitch bike rack is a secure and safe to use model that conveniently carries two bikes at one time. The weight capacity is great meaning it can handle a range of bike models or brands. The swing down feature on this bike rack makes it incredibly quick and easy to use which is ideal for families that are always on the go. The steel construction is heavy duty and durable, meaning this rack will last you a long time. Although it is tough, this bike rack is gentle on your bikes and will not damage the paintwork. The bike cradle is adjustable and comes with a hook and loop system to make it even more secure. Why We Liked It – This hitch bike rack has a great capacity and is easy to use, making it ideal for families on the go. The Hollywood Racks Express Trunk Mounted Bike Rack carries up to three bikes which makes it a brilliant option for busy families. It features of a soft rubber cradle that protects your bike’s finish and paintwork. This bike rack is adjustable and easy to use, making it suitable for almost all vehicles. This hitch bike rack features four attachment straps that offer a secure fitting. It is easy to use as it comes fully assembled, meaning you can get out there without delay. This bike rack can fold flat for easy storage making it incredibly convenient for on the road adventures. Why We Liked It – This hitch bike rack is convenient and easy to use making it a brilliant option for on the road. This hitch bike rack is suitable for most dual-arm bikes and is suitable for a range of vehicles. 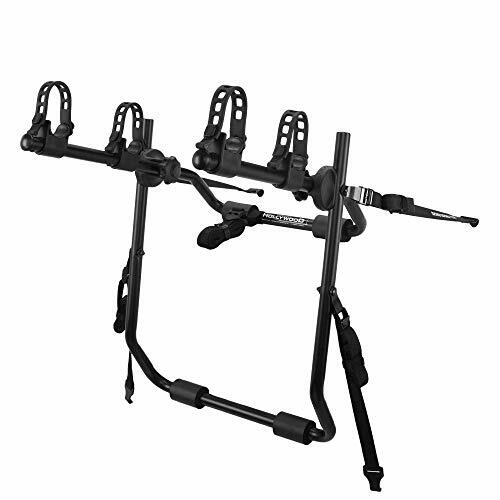 This bike rack has a great capacity and can carry four bikes at once, making it suitable for family vacations or other large scale cycling trips. It is a sturdy and handy construction that features locking and safety straps. This bike rack is incredibly convenient and has a tilt down feature with foldable carry arms when not in use, making it easy to store. The soft cradles and bar cushions are designed to keep your bikes secure without causing damage to the paintwork or frame. Why We Liked It – This hitch bike rack is incredibly convenient and has a great capacity making it suitable for all vacations. 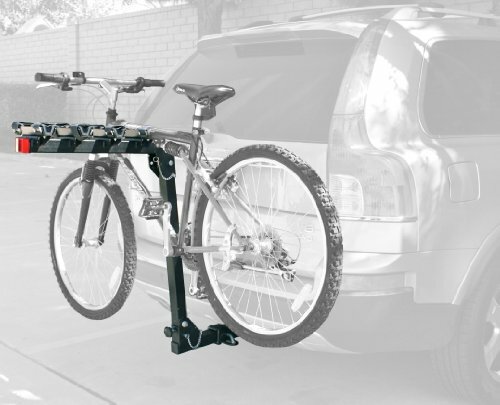 This hitch bike rack has a quick installation and is suitable for most vehicles. It is incredibly easy to use with the quick-set carry arms that snap into place which can fold out of the way when not in use. The cradles feature a dual compound tie-down system and quick set straps that individually secures and protects your bikes. The internal tilt-away release allows for easy lift gate access, ensuring that you can get on the road without hassle. This bike hatch features a padded spine shield that protects the bike’s paintwork during transport. This bike rack is incredibly secure and safe, making it ideal for a variety of cyclists. Why We Liked It – This hitch bike rack is incredibly easy to install and use, as well as having a compact storage. This hitch bike rack can handle four bikes at one time, making it ideal for families or large groups of cyclists on the road. It is designed to be effortless as it has a tilt backward design that is easy to install the bikes on, without needed to detach the hitch first. Each bike is secured onto the hitch with a three-point connection system, with two tray-style arms at the bottom and one vertical arm across the top. This prevents your bike from swinging or moving when in transit. This ensures that this bike rack is easy and safe to use for all occasions. Why We Liked It – This hitch bike rack has a great capacity and has an incredibly secure installation process. Having a bike is one of the best modern luxuries that almost anyone can afford. There is nothing better than going out and exploring with your bike – and thankfully they don’t have to come at a huge cost. However, when you decide to go further afield than your local neighborhood with your bike, then you may come into some difficulties. If you want to go further with your bike, then you will need a good quality hitch bike rack. 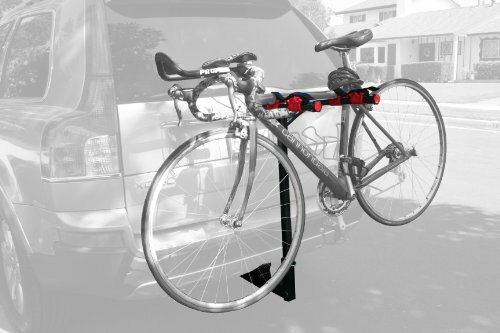 Hitch bike racks are designed to secure your bikes on the back of your car, making them incredibly easy to transport. In order to use a hitch bike rack, you need a rear hitch already installed. Hitches are commonly used with trailers, and some cars may already have an attachment available. There are so many different kinds of bike racks on the market, making the decision of what is the best one for you quite complicated. Hitch bike racks have often been considered to be the best due to their versatility and security. If you do not know what you need from your hitch bike rack, then you may find it difficult to maneuver through this industry. 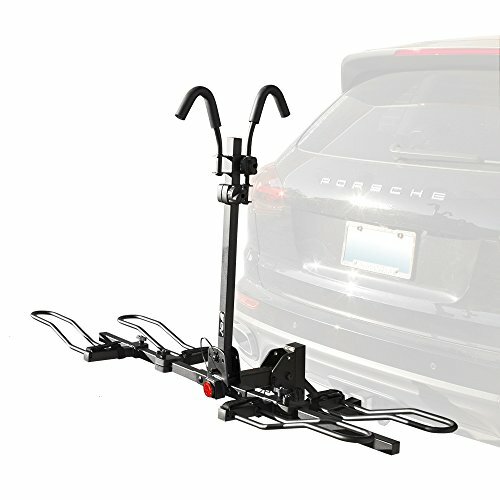 Is A Hitch Bike Rack For Me? If you are a cyclist, then a hitch bike rack could be an essential purchase for you. Hitch bike racks can make all the difference to your hobby, but without this knowledge, you may be wondering whether this additional expense is worth it. However, if you are a serious cyclist and want to make the most of your sport, then you may seriously benefit from having a hitch bike rack. A hitch bike rack is a device that slides onto the receiver of a trailer hitch on a car or van. As long as you can attach a hitch mount to your vehicle, then you can use a hitch bike rack. This versatile and accessibility, as they are suitable for a range of cars, is just one of the reasons why hitch bike racks are so popular. If you come from a family that is interested in cycling or perhaps you want to bring your friends on the road with you, then a hitch bike rack may be the best option for you. This kind of bike rack can carry multiple bikes at once. The most common capacity of a hitch bike rack it two bikes. This can be seen throughout this review. Racks such as the Allen Sports Deluxe Hitch Mounted Bike Rack can comfortably carry two bikes and keep them both secure when you’re traveling on the road. 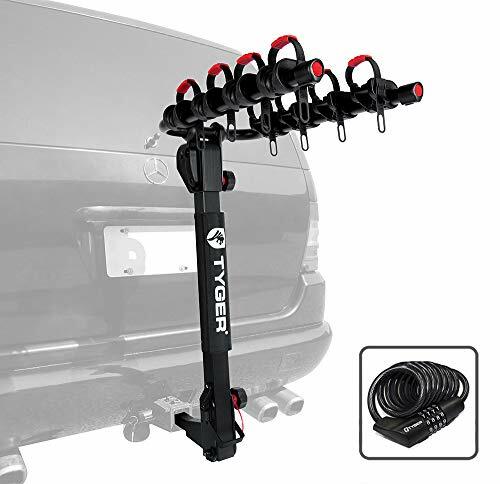 If you want to bring your full family or a larger group on the road with you, then you may want to choose a bike rack such as the Tyger Auto TG-RK4B102B Deluxe 4-Bike Carrier. This bike rack has the largest capacity throughout this review and can carry four bikes at one time. All of your bikes will be equally secured to this hitch bike rack. This security can be heightened due to the additional straps and other adjustable features. This kind of hitch bike rack is an excellent option for those in large groups who may be going on a cycling holiday or for those who want to get their friends or family more excited about the sport. There is a range of hitch bike racks that have varying capacities, meaning there is certain to be the best one out there for your needs. A lot of standard bike racks that may be secured to the roof of your car or the trunk often come with an abundance of straps. These straps are used by you to secure the bike rack to your car or minivan. However, this system comes with its own fair share of flaws as the bike rack will only be as secure as your knots are. This kind of bike rack can easily come loose and may cause damage to your vehicle or bikes if this occurs. Hitch bike racks, however, have a better and more secure system that can be fitted onto almost any vehicle. They are installed by sliding onto a trailer hitch that has already been installed and secured onto your car. Although straps are used in hitch bike racks, this is typically used as additional support to your bikes rather than keeping the bike rack attached. Hitch bike racks are one of the most popular options for cyclists as they are so secure and easy to use. Having your bikes secured to the back of your vehicle means that you have a lot more room in your car for your family and luggage when going on the road. Although other bike racks can do this also, such as roof bike racks, these often come with more maintenance. Roof bike racks, for example, require your vehicle to be in a certain position and can limit where you are able to drive. Hitch bike racks, as they are secured on the back of your car, are brilliant at saving space and do not prevent driving in certain locations. They are incredibly safe to use and convenient, which is why they are one of the best. Some bike racks may require you to take apart your bike or remove wheels in order to get them secured to your car. 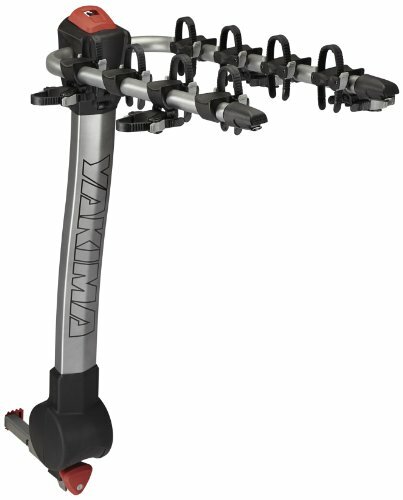 Hitch bikes racks, such as the Yakima Products Ridgeback Hitch Bike Rack, are incredibly convenient and quick to use as they do not require you to pull apart your bike. Your full bike as it is can be secured to your vehicle so you can get on the road quickly. Hitch bike racks are incredibly easy to use as you simply slide your bike onto the rack and then secure. There is no need for tools or maintenance at either end of the journey, which is why many families or busy people prefer hitch bike racks. You don’t want to have to wait to enjoy the freedom that cycling offers. The best style will differ depending on your vehicle, how many bikes are needed to be taken on the road and what kind of bikes you have. The weight of a hitch bike rack is an important consideration due to the installation and removal that will have to happen at the end of each road trip. It is also important to consider the weight to see how suitable the bike rack will be for your vehicle, as too heavy of a bike rack could cause damage to your car. 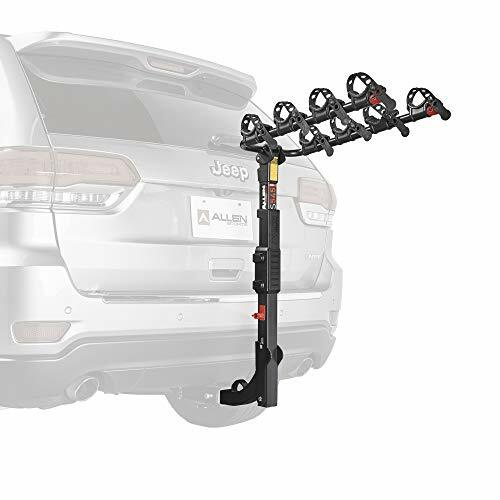 The heaviest hitch bike rack throughout this review is the Tyger Auto TG-RK4B102B Deluxe 4-Bike Carrier which is 77-pounds. The lightest through this review is Swagman XC Cross-Country 2-Bike Hitch Mount Rack at an incredible 5 pounds. When looking for the best hitch bike rack you need to know how many bikes you want to take on the road with you. This is perhaps the most important thing to consider for all bike racks, as this is their purpose. 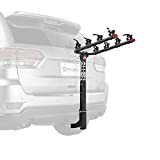 If you want to bring the whole family out on the road with you, then you should consider a bike rack like the Hollywood Racks Express Trunk Mounted Bike Rack which can hold three bikes securely. Most hitch bike racks throughout this review are made to hold two bikes. As a bike rack is only used for one specific purpose, how easy it is to store may be an important factor for you. A lot of hitch bike racks throughout this review, like the Hollywood Racks Express Trunk Mounted Bike Rack, can be conveniently folded making them easy to store after use. If the bike rack is easy to store you can leave it in the trunk of your car until you next need it. A hitch bike rack is a type of bike rack that slides onto the receiver of a trailer rack, which is secured onto the back of your car. This means that in order to use a hitch bike rack you need to have a trailer rack. This kind of bike rack is seen as more convenient than roof or trunk-mounted bike racks. Hitch bike racks are incredibly secure and are often able to hold more bikes than any other models. They do not hinder your vehicle or the way you drive. As well as this, hitch bike racks are incredibly easy to use and install which is why they are popular with cycling families. 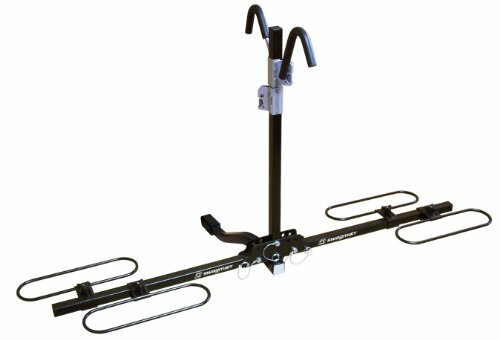 What Hitch Do I Need For My Bike Rack? This will differ depending on the kind of hitch bike rack you have purchased. Most car hitches have a 2”x 2” or a 1 ¼” x 1 ¼” receiver. These are the dimensions that you need to pay attention too when purchasing a hitch bike rack in order to find the one that best fits your car. Hitch bike racks are more convenient than any other bike rack as they are easy to install, use and store. Use the dimensions of your car hitch to determine what hitch bike rack you need.